My days in the Tower learnt me to love wicked talk. If I ever feared I might find life tedious among the ladies in our household, I was mistook. True, my lord’s mother the old Countess was much given to praising Mr Secretarie Cecil. Even when there was none of consequence to hear her. She swore she would never forget he’d saved her son’s life. And she prayed her son would never forget neither. But I also heard that poor Mr Secretarie was much offended by a rascal that took horse for Scotland with newes of the old Queen’s death. That rascal set forth post haste before the Council had sent their own messenger! Sure, he hoped for great rewards from King James. First come, first served. Many ladies came to visit my lord’s lady Puss [Bess]. I lay prick-eared beneath the table whereat they drank their wine and I heard much to think on. I knew not who those ladies were, but believed two might be the late Earl of Essex’s sisters, of whom my mother loved to speak. One sister [Penelope] was heroick. She had two husbands. And she stood firm at Essex House the night my mother and all defied the soldiers of Her Majestie. A portrait c1581 said to be of the Earl of Essex’s sisters. 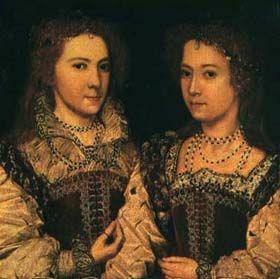 Dorothy (left), now Countess of Northumberland, and Penelope (right), still married to Robert, Lord Rich, but the wife of Charles Blount, Lord Mountjoy in all but name. The other sister [Dorothy] had an evil husband who told her he was joyed her brother’s head had been cut off. Or so sayt my mother, who called her heroick too. Word of Mr Secretarie put me in mind of my own pretty sister, who’d turned uppish after she was offered employment in his household. I learnt she’d had more to brag of since. Mr Secretarie had a fine new house, and Her Majestie had gone to its warming. Her Maj never arrkst where he got the money. Hooked it from her purse, most like. One young lady brought us strange newes. She sayt that not long before Her Maj died, she (Her Maj, I mean) had seen herself very lean and fearful in a light of fire. Mayhap Her Maj feared she was going to be entertained in a hotter place than she ever was in this world? Another sayt Her Maj spake sharp to Mr Secretarie when he told her she must go to bed. She told him “must” was not a word to be used to princes, and if his father were still alive he would not have durst speak so. Then she sayt: Little man, little man, you know I must die and that makes you presumtious. Presumtious. A new word, and a good one. I vowed to grow presumtious too. And I heard Her Maj’s corpse would have to be put away soon, lest it come to abominate us all. Stinks, I mean. It had been brought in a box to White-Hall from the palace where she died. Lords and ladies watched this box by night and day. Why? Did they fear Her Maj might spring out again? All this watching and waiting was an annoyance to the ladies. Why? Because King James had left his wife, our new Queen, in Scotland. She would wait until the English ladies who must attend Her Maj’s funeral could go to greet her. “Must” is not a word to be used to any woman. Nor to us cats, come to that. But I saw the ladies were happy. They that never had good places in Her Maj’s household would fare better with the new Queen. The friends of Essex had been cast down, and now would be raised up again. The ball was at our paws. Rewards and revengeance would be ours. Surviving letters and memoirs indicate London was heaving with gossip after Elizabeth’s death on 24 March 1603. King James had left Edinburgh on 5 April. Despite having sent word that Elizabeth was to have a funeral with all the honour due to a great prince, he showed no inclination to attend. By mid April he’d only got as far as York. The funeral was set for 28 April. The weather was warm. Elizabeth had decreed that her body not be embalmed – an invasive process loosely described by Tricks in her macabre Hallowe’en tale. 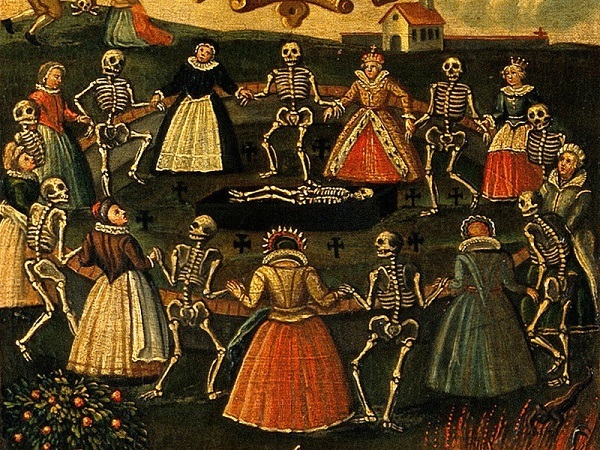 Instead, Elizabeth’s body was well-wrapped in cerecloth – expensive waxed cloth. Or was it? There was a rumour that not enough cloth had been used. And also a contradictory hint that Sir Robert Cecil had ignored Elizabeth’s decree. Her body had been embalmed (sort of). The most scandalous memoir comes from Elizabeth Southwell, 16 or 17 at the time, who claimed Elizabeth’s coffin burst open while she was taking her turn to keep watch. Hasty repairs were necessary. 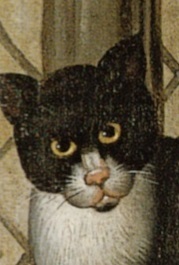 The “rascal that took horse” was Sir Robert Carey/Cary (c1560-1639). His lively and self-serving memoir includes an assurance that when the Queen could no longer speak she put her hand to her head at mention of King James’ name, thereby indicating he should wear her crown. Carey, by using a mix of bribery and family connections, was among the first to learn of Elizabeth’s death. He left London at around 9 or 10 on the morning of Thursday 24 March, and reached Edinburgh, around 400 miles north, late on Saturday night. He’d intended to arrive by early evening, but a bad fall from the horse he rode on the last leg of his journey slowed him down. An extraordinary ride. King James asked for proof: a letter from the Council. Of course Carey didn’t have one, but presented James with a blue ring from his sister Philadelphia, Lady Scrope/Scroop. She was one of Elizabeth’s senior ladies, and had been a supporter of the Earl of Essex. The ring (a sapphire?) she’d sent James was a pre-arranged signal. The Essexians’ star was rising, and Sir Robert Cecil – now well ensconced in James’ favour – knew it. He sent Essex supporters Sir Charles Percy and Thomas Somerset to Edinburgh with the Council’s dispatches for James. 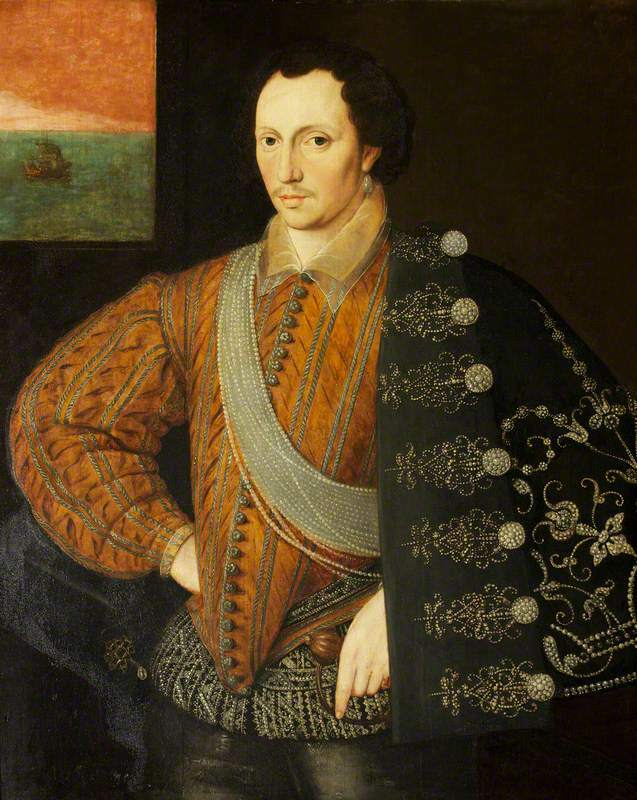 The Earl of Southampton’s friend Sir Harry Danvers (whose brother Sir Charles was executed for his part in the Essex rising) was sent to Ireland.